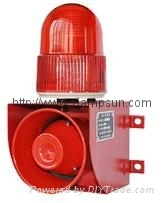 YS-01 acoustic-optic alarm adopt by international advanced acoustic-optic technoly which special used for forklift, crane, travelling bridge etc. Inner core used by advanced ASIC with strong resistance of interference. Outer used by welded steel plate with advanced technology, the structure design is novelty; Strobe light adopt by LED which enhance the lamp service life. YS-01 with the features of light weight, waterproof, shockproof, easy to installation etc, is suitable for the environment of noisy industry. Users can choose the most suitable voltages, audios and alarm way according to the different situations. Applicationof liftingmachinery,gantry cranes,bridge cranes, ports, terminals, etc.